Twain's 'Letter From Santa Claus,' A Gift For All Ages In 1875, Mark Twain wrote a letter to his 3-year-old daughter from Santa Claus. NPR's Scott Simon reflects on a father's love for his daughter at Christmas time. 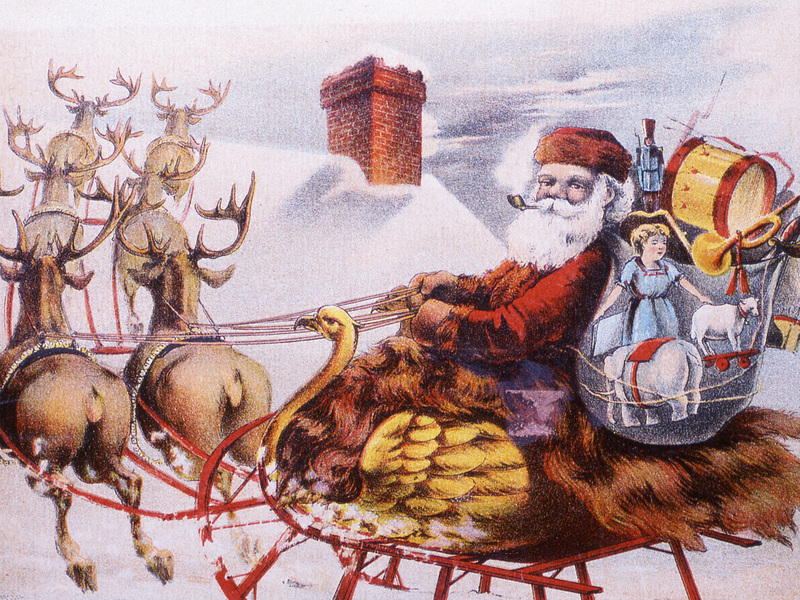 A trade card from the 1880s depicts a Santa Claus figure in a bird-themed sleigh pulled by reindeer as they are about the land on a rooftop to deliver presents from the huge sack of gifts. One of the pleasures of being a parent is the chance to discover things you missed as a child the first time. This week I found a copy of Mark Twain's "A Letter from Santa Claus" that he wrote in 1875 for his 3 year old daughter, Susie, to see on her pillow Christmas morning. "(F)or although you did not use any characters that are in grown peoples' alphabet, you used the characters that all children in all lands on earth and in the twinkling stars use ..." he wrote. Our last lot of kitchen furniture for dolls has just gone to a very poor little child in the North Star away up, in the cold country above the Big Dipper. Your mama can show you that star and you will say: 'Little Snow Flake,' (for that is the child's name) 'I'm glad you got that furniture, for you need it more than I.'" I shall ask you what color you want the trunk to be. Your mama will help you to name a nice color and then you must tell me every single thing in detail which you want the trunk to contain. Then when I say "Good-by and a merry Christmas to my little Susie Clemens," you must say "Good-bye, good old Santa Claus, I thank you very much and please tell that little Snow Flake I will look at her star tonight and she must look down here" ... and every fine night I will look at her star and say, 'I know somebody up there and like her, too.'" It is poignant to read this letter. Susie Clemens was especially close to her father, and became a writer, too. But she died of spinal meningitis when she was 24, and left a hole in her father's heart. What you can hear in the words of Mark Twain's Santa is a parent who, in this season and all others, wants to give his child the world.